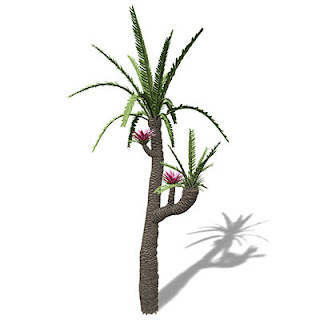 Reconstruction of the bennettitalean Williamsonia, a potential stem-angiosperm. Image from Turbo Squid. I'm going to break one of the supposed blogging rules - I'm going to feed a troll. In the comments thread to the bird evolution post I wrote recently, one commenter brought up the supposedly intractable evolutionary problem of the "sudden" appearance of flowering plants. I briefly responded to this comment at the time, but I thought the question is an interesting enough one to deserve further investigation. So here is my presentation on why the "sudden" appearance of flowers was not so sudden. The origin of the angiosperms (flowering plants) has long been considered one of the great unsolved questions of biology, and I must confess to having occassionally slipped into the hyperbole myself. However, we actually have some much better ground to stand on than the hyperbole might suggest. First off, we need to ask what exactly makes flowering plants so distinct? What do they have that no other plant has? I bet some of you are fighting the urge to reply with, "They have flowers. Duh." To which I have to reply - wrong! After all, you could debate to what extent the reproductive structures of many flowering plants can really be called 'flowers'. Many flowering plants lack the petals and/or sepals of more classic flowers. They may have bracts (coloured leaves) instead, like poinsettias or bougainvilleas, while many wind-pollinated angiosperms simply do without ornamentation entirely. And if we argue that petals are not necessary to count as a flower - if those plants that surround their reproductive structures with bracts also count as having flowers - then flowers are not actually unique to angiosperms (as I'll explain in a minute). No, the really significant feature of angiosperms is the carpel, the protective covering of two integuments that encloses the ovule of angiosperms. In other living seed plants, the gymnosperms, the ovules generally have only one integument and are produced exposed on the ends of short branches, often surrounded by a protective whorl of leaves or leaf-derived structures to form a structure called a strobilus (in many conifer groups, these protective leaves have become hard and woody to form the scales of a cone with an ovule at the base of each scale). Morphological and molecular phylogenetic analyses disagree significantly about the relationships between angiosperms and living gymnosperms (Friedman & Floyd, 2001). Morphological analyses place angiosperms nested within gymnosperms, forming a clade with the Gnetales, while molecular analyses place the angiosperms as sister to all living gymnosperms, not closely related to Gnetales. While there is a significant divide between the carpel-enclosed ovules of angiosperms and the exposed ovules of gymnosperms in living taxa, this divide (unsurprisingly) actually dwindles when we consider fossil taxa. Debate still rages about which fossil taxa are the closest relatives of angiosperms, but two taxa that pop up on a regular basis are the Bennettitales and Caytonia. These taxa are often closely related to angiosperms and the Gnetales in morphological analyses (Doyle, 1998), while if morphological analyses are constrained to match the molecular trees the angiosperms form a clade with Bennettitales, Caytonia and glossopterids (Doyle, 2006). The Bennettitales and Caytonia both put in an appearance during the Triassic and survived until the end of the Cretaceous, while angiosperms are first known from the early Cretaceous (Doyle, 1998). Caytonia is generally described as a "seed fern", which were usually trees, but articulated fossils are fairly rare. It produced multiple single-integument ovules reflexed and contained within a protective structure called a cupule. It does not take a significant leap to imagine the reduction to a single ovule per cupule and the cupule developing into the outer integument of the angiosperm carpel. (From Frohlich & Chase, 2007) Reproductive structures of fossil stem-angiosperm candidates. a, Glossopteris showing cupules borne on stalk above a leaf. b, Caytonia male (above) and female (below) reproductive units. c, Caytonia cupule. d, Corystosperm (Umkomasia) cupule containing one ovule. Cupule wall almost surrounds ovule, except for a slit facing the stalk. e, Bennettitales (Williamsoniella) bisexual reproductive unit; each oval pollen sac consists of several fused microsporangia. Ovules are borne among scales on the central stalk; in Vardekloftia each is enclosed by a cupule wall. Green, cupule wall; red, ovule; yellow, pollen organ. Bennettitales were plants fairly similar in appearance to modern cycads that lacked any such carpel-like arrangement and had ovules born along scales in the strobilus. What Bennettitales did have, however, were flowers (of a sort). The leaves of the strobilus were expanded into flower-like bracts that were quite large (and possibly quite colourful) in a number of taxa. Certain features of the bennettitalean bracts suggest that they had a role in attracting insect pollinators, just as modern flowers do today (Gottsberger, 1988). The largest bennettitalean "flowers" were found in Cycadeoidea, which had the bracts recurved to enclose a central chamber containing the reproductive organs. This is of great significance because similar arrangements are found in modern beetle-pollinated flowers, which are believed to be among the more basal flower forms. Also significant is the presence in bennettitalean fossils of the chemical oleanane, derived from a secondary metabolite that is only produced by angiosperms among living taxa, further supporting their relationship (Taylor et al., 2006). The earliest major pollinators of flowers were probably beetles and flies (Kevan & Baker, 1983). Beetles in particular are the major pollinators of members of basal angiosperm orders such as Magnoliales and Nymphaeales. The two insect groups most commonly associated with pollination in most peoples minds, butterflies and bees, were unlikely to have been significant players in the origin of flowers for the simple reason that neither had come into existence yet - Lepidoptera as a whole only started making an appearance during the Cretaceous, while bees were not to appear until the Tertiary. As already noted, many of the basal angiosperm groups show adaptations towards beetle pollination (this is why magnolias, for instance, produce such a powerful perfume and white flowers - nocturnal beetles use smell more in finding food, while white stands out more at night than colour would). Many beetle-pollinated flowers have some sort of enclosed chamber, or close during the day, providing their pollinators with a safe haven from predators as well as providing food in the form of nectar or pollen (it is quite alright if the pollinator eats some of the pollen so long as the flower produces far more than the pollinator can eat - indeed, if the pollinator is actually going for the pollen then it will almost certainly be rooting around in it and getting covered with it), and this may have been the approach Cyacadeoidea was going for. On the other hand, another basal angiosperm family, the Winteraceae, have open and unspecialised flowers that attract a wide range of pollinators such as beetles, moths, flies and thrips. 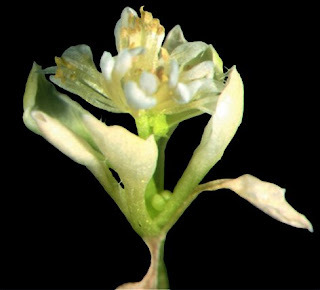 Arabidopsis with induced mutation causing leaves to be partially converted into petals. Photo from University of California, San Diego. Insect-attracting strobili such as found in Bennettitales could have quite easily given rise to the first flowers. Developmental genetics has confirmed the theory put forward many years previously that petals and sepals represent modified leaves, and by affecting the expression of the genes involved it has proved possible to make leaves grow instead of petals, and petals grow instead of leaves (Goto et al., 2001). So while we have still not entirely solved what Darwin so overquotedly referred to as the "abominable mystery", the answer has drawn tantalisingly close. Doyle, J. A. 1998. Molecules, morphology, fossils, and the relationship of angiosperms and Gnetales. Molecular Phylogenetics and Evolution 9 (3): 448-462. Doyle, J. A. 2006. Seed ferns and the origin of angiosperms. Journal of the Torrey Botanical Society 133 (1): 169-209. Friedman, W. E., & S. K. Floyd. 2001. Perspective: The origin of flowering plants and their reproductive biology - a tale of two phylogenies. Evolution 55(2): 217-231. Frohlich, M. W., & M. W. Chase. 2007. After a dozen years of progress the origin of angiosperms is still a great mystery. Nature 450: 1184-1189. Goto, K., J. Kyozuka & J. L. Bowman. 2001. Turning floral organs into leaves, leaves into floral organs. Current Opinion in Genetics and Development 11 (4): 449-456. Gottsberger, G. 1988. The reproductive biology of primitive angiosperms. Taxon 37 (3): 630-643. Kevan, P. G., & H. G. Baker. 1983. Insects as flower visitors and pollinators. Annual Review of Entomology 28: 407-453. Taylor, D. W., H. Li, J. Dahl, F. J. Fago, D. Zinniker & J. M. Moldowan. 2003. Biogeochemical evidence for the presence of the angiosperm molecular fossil oleanane in Paleozoic and Mesozoic non-angiospermous fossils. Paleobiology 32: 179-190. I'm still not too familiar with plant anatomy, but it's interesting to see such vividly coloured strobili. Good to see you back, Julia - we've missed you (though I thought if anything was going to bring you out the woodwork, it would be a fossil plant post :-D ). As you alluded to, they're not actually "flowers", despite the newsletter, but strobili. I'm guessing Wollemia is probably wind-pollinated like other conifers, but some gymnosperms are insect-pollinated, particularly Gnetales (Gnetum and Welwitschia - Ephedra is wind-pollinated). Welwitschia has bright red strobili. I was going to write about Gnetales strobili, which are often referred to as flowers even in the professional biology literature, in the main post, but I couldn't find the details of their structure so I had to leave them out. I'll have to digest the rest of your post when I'm more awake. A great post... incidentally the earliest fossil bee is Cretotrigona prisca (Michner & Grimaldi, 1988) from the Late Cretaceous (Turonian) New Jersey amber. Engel (2000) demonstrated that Cretotrigona is derived within the tribe Meliponini; meliponines already occupy a derived position within Apidae, suggesting that the diversification of bees had already occurred by the Late Cretaceous. Indeed, there is a general consensus that the radiation of the bees took place shortly after the rise of the angiosperms, probably during the early-mid Cretaceous. Thanks for the correction, Sam. It would seem that there is still a ways to go before solving the angiosperm mystery. There is a quite a discrepancy between the earliest fossil angiosperms (Early Creteaceous) and the origin according to molecular biologists, which could go back as far as the Triassic. Actually, that isn't really that much of a discrepancy. The molecular time estimate is for when the ancestors of angiosperms diverged from other living plants, while the Cretaceous time is the appearance of angiosperms themselves. The stem-group of angiosperms could have been around for some time before giving rise to species that possessed the angiosperm characters. For someone who has just dipped her toes into the field of plant systematics, this post is absolutely fascinating - and filled with terms I see I need to learn. Thanks for putting it together. Excellent post! The extensive reference list is especially impressive. As already noted, many of the basal angiosperm groups show adaptations towards beetle pollination (this is why magnolias, for instance, produce such a powerful perfume and white flowers - nocturnal beetles use smell more in finding food, while white stands out more at night than colour would). We don't actually know that this explains magnolias' perfume and flower color, right? Stating it as fact comes across as an evolutionary 'just-so' story, something that I think we would all do well to avoid. Well, whether the magnolia is pollinated by beetles because of its form or whether it has its form because it's pollinated by beetles might be an open question, but I don't think there's any doubt about the relationship. There are very strong correlations between flower features and the nature of the pollinator. Strong scent and white coloration are often connected with nocturnal pollination, while the open-bowl shape of magnolias and waterlilies is connected with pollination by beetles and such rather than by moths - moth-pollinated flowers tend to be more tubular. Other pollinators are associated with different flower forms - bird-pollinated flowers, for instance, are usually tubular, brightly coloured (more often than not they're red) and generally don't have much in the way of scent. Good to be back (slowly and gently at first though!). Yes, looking at the strobili they're almost certainly wind-pollinated. I know the Cornish ones have been done artificially as there aren't any other "flowering" Wollemia in the vicinity. I couldn't tell you what the Gnetales' strobili look like either. I'm aiming to get hold of an Ephedra for my garden, and all Chiltern Seeds say is the "flowers" look like "clusters of bark fragments"! great to read about the early flowers. it helped me to give some notes to my botany students here. great work and i wish there were more references.